My hunt for stylish and comfortable shoes started when I realized that my social media entrepreneur career required me to attend numerous conferences each year. I had not worked in an office since I was at Deloitte many years before, so my wardrobe needed to be updated. I searched from one shoe store to another desperately trying to find comfortable yet stylish shoes. Finally at Nordstrom I saw Sofft shoes for the first time, then bought them immediately because they looked great and seemed comfortable. When I started wearing my first pair of Sofft shoes to different family and work events, I always recieved compliments on how stylish the shoes were but was delighted that they were also comfortable. I even surpised my friends by running after my boys – in heels! That started my obsession with Sofft shoes as my go-to “can wear all day” shoes that have the perfect mix of style and comfort. 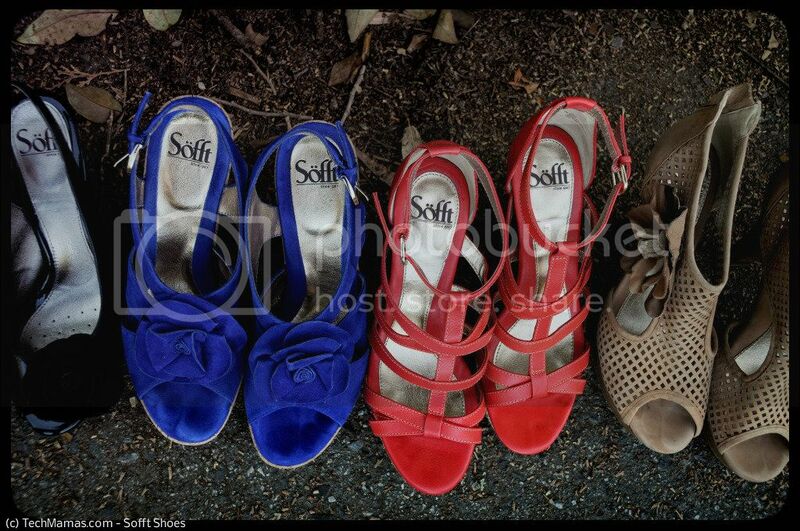 I bought just a few more Sofft shoes to add to my collection over time. I took the comfort test to the limit by wearing Sofft shoes at the multi-showroom floors of the Consumer Electronics Show and recieved many compliments from people who saw me at the conference. At Mom 2.0 Summit in New Orleans last year, I wore my Sofft Shoe heels from the French Quarter many blocks back to the hotel. My social media buddies that were walking back with me were all either wearing flats or sneakers – and in total shock that I could comfortably walk that far in heels. My “comfortable and stylish heels” a.k.a Sofft shoes became well known with all of my social media buddies, who always asked me who made those shoes. We all know that elated feeling when you can check one thing permantely off your busy “mom list” (i.e. find comfortable and stylish shoes). I could make it through any event without taking my shoes off in pain (like before). I consider myself a technologist and not a fashionista, so finding my own style took some time.. But it was worth it! Now I just need to find a pair of jeans that stretch in all the right places without giving a peep show when I bend down to play with my kids or pick something up from the floor. I decided to reach out to Sofft Shoes to tell them my story a.nd they enjoyed hearing about it. Sometime later Sofft shoes decided to surprise me with some spring/summer collection shoes to review right before my son’s Bar Mitzvah (the timing was great for me)! 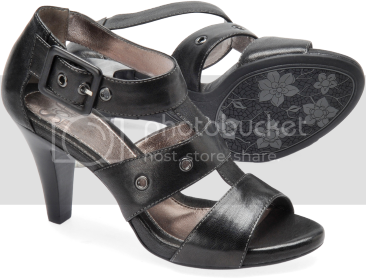 My closet already had over 9 pairs that I had purchased myself – but mostly in black, grey and metallic. I decided it was time that to move out of my comfort zone and try shoes in spring/summer colors. After the shoes arrived I wondered WHAT HAVE I BEEN MISSING! I now tell my friends, once you try colorful shoes – you never go back! I also say “once you try Sofft shoes – you never go back”. As a blogger, my goal of every post is giving my authentic opinion on events or products – so I try not to gush too much about any one product. Because I was a Sofft customer who had purchased many shoes before I started a relationship with the brand – I can honestly gush that their shoes are an essential part of my wardrobe. As a busy mom, I don’t have much time to make wardrobe decisions when getting dressed. So having the Sofft shoes in my closet has also saved me time and allows me to go from professional, to baseball games (in heels that allow me to run across a baseball field). Below are some pictures of the (angel music playing in background) box of shoes I received from Sofft shoes for review. Spring/Summer Sofft Shoe selections, including St Malo Sand color on far right. Above: Odelle Sofft shoes in Ink Blue. Above: St Larouse in Coral color. The Sofft Gironne in Black Patent (above) has a sleek look for dresses, but could also be great with casual skirts or pants. The St. Malo (above) comes in black which goes with everything, but so does the sand color I am wearing above. It has a nice airy front with a bow to add a fun and flirty look. The St Larouse in Coral color (above) is that pop of color that will liven up any outfit. I am so happy I ventured from having all black shoes into appreciating how fun adding bright colors can be. 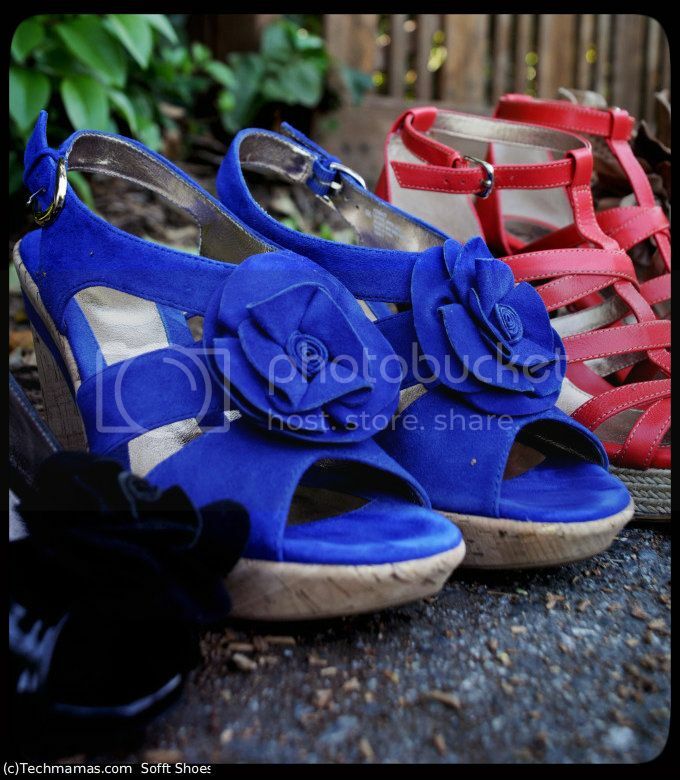 The Sofft Odelle in Ink Blue (above) has that cork wedge so popular with spring/summer, flowers to soften up the look and a bright color that stands out. Disclosure: I have been a dedicated customer of Sofft shoes for years (my closet is filled with shoes I bought from their collections ). The spring/summer collection shown on this post were samples I recieved were for review purporses. My words are my own. 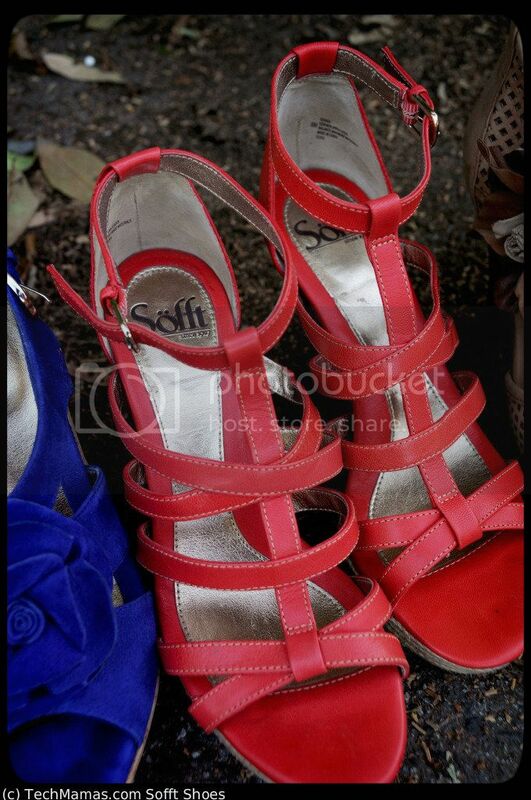 I love Sofft shoes! I have wide feet and hadn’t worn heels until I discovered Sofft in 2007. My favorites have been my Adara sandals. I had them in red and black, but I wore out the red ones. I would like to see Sofft create a “classics line”, where their more timeless styles can go instead of being discontinued. I would wholeheartedly nominate Adaras to be included. I still get lots of compliments on them and they have been “knocked off”/adapted by lots of companies. I absolutely agree with Lisa M. Add Belecia to that list. I still get lots of compliments when I wear them, but they are truly worn out and should be retired. I would also love to see more narrow styles. Narrows have become increasingly harder to locate. You are such the shoe model! And we all know Sofft shoe is your fav! They are so comfortable! I’ve had to avoid heels for the past couple of years too. I’d love to find a pair to wear to work (I stand all day in a salon), but even my Dansko “heels” won’t allow it. I’ll give Sofft a try and hope for the best! I love fit flops. I can walk miles in them!